Are you ready to support your favorite content creator AND buy games at the same time? Last year, Epic had announced an extension to Fortnite called Support-a-Creator, a program that provided a code for consumers to use that gave the content creator attached to that code a piece of the sale. So any skins, passes, or anything else you bought for Fortnite also helped you support them. Epic has expanded this role to their game store as well. Now anyone can enter a creator’s code at checkout when purchasing anything from Epic to support them and give them a little kick back. This is exceptional, especially with more and more developers heading to the Epic store due to the much preferred cut between Epic and developer being 80/20. Humble Bundle is a prime example of how well this program works, with their partners receiving a cut from any purchase made on the HB store, including the monthly subscription service that has become more popular over the years. Epic hopes that the program helps grow the platform beyond just Fortnite and brings in more variety so creators can be supported as well. The splits are simple as well. For every 100 dollars spent or 10000 V bucks used/purchased, the creator gets 5 USD dollars (or local currency equivalent). All you need to do is provide your referral links or your creator code and ask anyone purchasing a game to use them at their checkout screen. Simple as that. 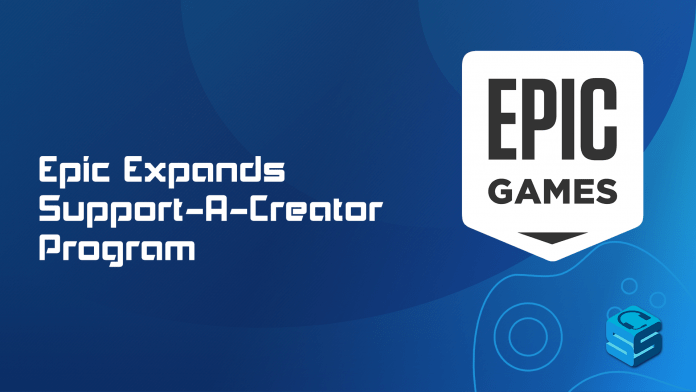 To qualify, creators must have 1000 followers on one major platform, complete the Affiliate Agreement provided by Epic, and make sure that they have the capability to receive payment from one of the sources provided. You can read more about the Support A Creator program and apply here!